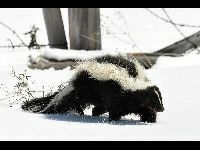 A Skunk releases its smell from under its tail. Skunks do not spray other skunks. Skunks are relatives to Weasels, Badgers, and Racoons. A Skunk's smelly spray is called musk. The three main types of skunks are striped, hog-nosed and spotted. 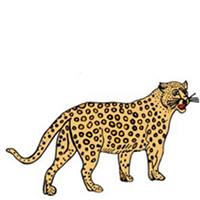 In America a Skunk is sometimes referred to as a Polecat. A baby Skunk is called a kit. You can use hydrogren peroxide + baking soda + liquid soap to remove skunk smell from a spray victim. 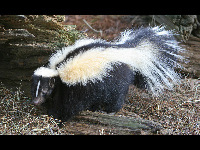 Skunks can be de-scented and kept as pets. Skunks in the wild have a lifespan of 2-4 years. Adult Skunks range in body length from 8 to 19 inches. Adult Skunks typically weigh from 5 to 14 pounds. The top speed of a Skunk ranges from 5 to 10 mph. Skunks live in small groups. Skunks live in underground burrows. A Skunk's spray can hit targets 12 feet away. Skunks are resistant to snake venom.